Join us this week for another exciting edition of the Robot Party! Grab your robots and tell your friends, hope to see cool robots there! 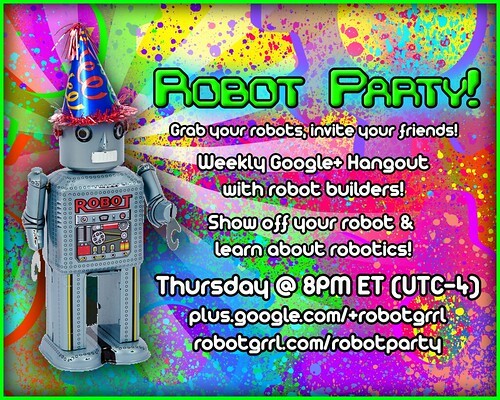 The Robot Party is a weekly Google+ hangout that brings together robot builders from all over to share their robots, knowledge, and ask questions! It is for all age ranges, young or old, just bring your robot! The Robot Party is every Thursday at 8PM ET (UTC-4)! If you have a robot, join the hangout on Google+ HERE! Be sure to leave a comment on one of the posts so we can add you to our circles for the party. If you don’t have a robot/don’t want to be in the hangout, you can watch the mirrored stream on this page!